THERE is coming a time, and it is already here, when there is going to be great confusion in the world and in the Church. After Pope Benedict resigned, I sensed the Lord warning me about this over and over again. And now we see it unfolding rapidly around us—in the world and in the Church. There are the political questions people are asking…. Who is the bad guy in the Ukrainian crisis? Russia? The rebels? The EU? Who are the bad guys in Syria? Should Islam be integrated or feared? Is Russia a friend of Christians or a foe? etc. Then there are the social questions… Is gay marriage permissible? Are abortions sometimes okay? Is homosexuality now acceptable? Can a couple live together before marriage? etc. Then there are the spiritual questions… Is Pope Francis a conservative or a liberal? Are Church laws about to change? What about this or that prohecy? etc. I spent the last couple of days visiting with people who are agnostic, if not atheists. Remarkably, we agreed on 99% of our conversations regarding some of the various political, medical, and environmental problems that we discussed. But as for solutions, we are likely worlds apart because my answer to the evils in our time is to return to God and live the Gospel; for this alone has transformed not only hearts but nations, as much as the sun has transformed the face of the earth. For the root of all our evils is sin. Thus, God is the only remedy for our spiritual sickness. But that is not the answer you will find emerging in a strange blend of truths lathered in humanist solutions. As one reviewer of the film “Thrive” wrote, ‘Rather than trying to improve the status quo, it integrates traditional progressive, conservative, and libertarian viewpoints, reconciling divisions that have long kept us separated.’ cf. see this forum discussion You see, Satan not only knows that atheism can never satisfy the human condition but neither can disunity. But what that fallen angel is proposing to humanity is not the worship of God nor that Christian unity which binds men in love. Rather, Satan desires to be worshiped himself, and will achieve it by bringing men, not into unity, but into uniformity—what Pope Francis calls “the single thought” where freedom of conscience is dissolved into a forced thought. Conformity through control, not unity through love. The Great Confusion that is here and coming, brothers and sisters, will be nearly irresistible. For, on the one hand, it will espouse universal brotherhood, peace, harmony, environmentalism, and equality. cf. The False Unity But any goal, no matter how noble, that is not based in the immutable truth of our nature, in the natural and moral law, in the truths revealed through Jesus Christ and proclaimed by His Church, is ultimately a falsehood that will lead mankind into a new slavery. Now, my regular readers know that I spoke recently of a Coming Wave of Unity. I believe that has already begun, as does Pope Francis: the man who brought us this message from Pope Francis was the late Anglican Bishop Tony Palmer who recently passed away in a tragic motorcycle accident. Let us remember this “apostle of unity” in our prayers. But we must have our head on because there is a false wave of unity coming as well, cf. The False Unity one that will seek to drag as many faithful Christians into apostasy as possible. Don’t we see the first signs of this already? How many Catholics compromise the truth? How many Protestant denominations are rapidly abandoning and re-writing biblical principles? How many career-clergymen and theologians continue to water-down truth or remain silent in the face of an outright assault upon our faith? How many Christians are on fire for the world’s glitter rather than Jesus’ glory? 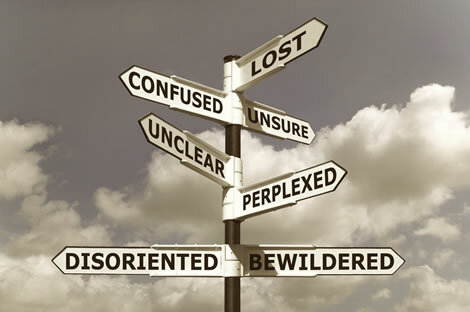 Watch in the days ahead for this signpost of confusion. We’re going to see it appear in nearly every facet of our lives, from family turmoil to global disarray. For as I wrote in Global Revolution!, the whole modus operandi of the world’s controlling powers is to bring “order out of chaos”—the chaos of confusion. Some of you may not subscribe to the message that has been coming out of Medjugorje the past 33 years, but I’m going to tell you now: it is absolutely bang on, whether you believe it to be of supernatural origin or not. It is, without question, the remedy to survive our times for it is thoroughly the teaching of the Church. see The Triumph – Part III In a word, it is prayer. cf. the five points at the end The Triumph – Part III; cf. Five Smooth Stones If you are not learning to pray, to hear the voice of the Shepherd, to walk in communion with the Lord, then you are not going to survive the tsunami of deception that is here and coming. Period. It is in prayer that we not only learn to hear God’s voice, but receive the graces necessary through relationship with Him in order to be fruitful, in order to become participants in God’s plan rather than antagonists to it. I am trying to live this message… and when I don’t, I learn real fast that I will be wiped out unless I am on the Vine, who is Jesus, without whom I “can do nothing.” cf. John 15:5 Prayer needs to reign in our hearts. We are going to need each other in the days to come. Satan has so fractured the body of Christ that I doubt the majority of Christians alive today know what the “sacrament of community” really is or what it’s like when the body of Christ begins to move as a body. cf. The Sacrament of Community and Community… An Encounter With Jesus So delicate is the road of authentic ecumenism cf. Authentic Ecumenism ahead of us that only by His grace can it be traveled… but a road, nonetheless, we must travel. For when we will be persecuted by those who hate us because we do not agree to their “solutions” for world “peace and harmony,” our common, united love for Jesus will be the flame of love that burns above all others. Prayer, unity, fasting, reading the Word of God, Confession, the Eucharist… these are all antidotes to the Great Confusion that, when we do them and receive them with the heart, will push out the darkness and make room for He who is the Great Clarity—Jesus, our Lord. 1. I may not have posted a new writing for several weeks. 2. You may not actually be subscribed to my email list. Subscribe to “The Now Word” here. 3. My emails may be ending up in your junk mail folder or blocked by your server. Check the junk mail folder in your email program first. 4. ↑ the man who brought us this message from Pope Francis was the late Anglican Bishop Tony Palmer who recently passed away in a tragic motorcycle accident. Let us remember this “apostle of unity” in our prayers.